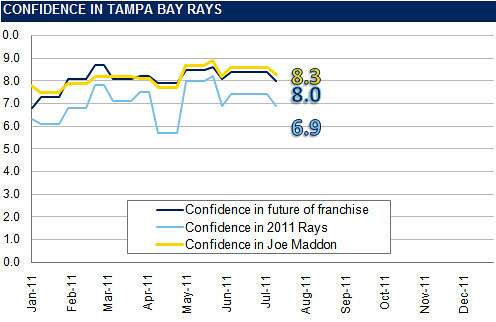 Confidence in the 2011 Rays went from 7.4 to 6.9. The most common response was “8” at 34.6%. Confidence in the future went from 8.4 to 8.0. The most common response was “9” at 37.1%. Confidence in Joe Maddon went from 8.6 to 8.3. The most common response was “9” at 36.3%.